7. "Cast thy bread upon the waters and upon the land, for thou shalt find it after many days" (Eccl. xi. 1, with the addition of the word , "and upon the land"). 14. "A fire, when it is kindled [Neubauer, ib., suggests , "little" instead of "kindled"], burns many sheaves" (compare James iii. 5). 15. "An old woman in the house is a good omen in the house" ('Ar. 19a, according to which in the present passage is the status absolutus of , and is to be translated by "old woman"; compare Rashi on Lev. xxvii. 7). The parallel citations from rabbinical literature show that only five of these twenty-two proverbs are known to Talmudic-Midrashic literature; consequently they can not be regarded as being drawn from it. It is noteworthy that two of them, Nos. 17 and 22, agree almost literally with two of Aḥiḳar's proverbs, Nos. 43 and 71 (in the Syriac). A comparison reveals the fact that No. 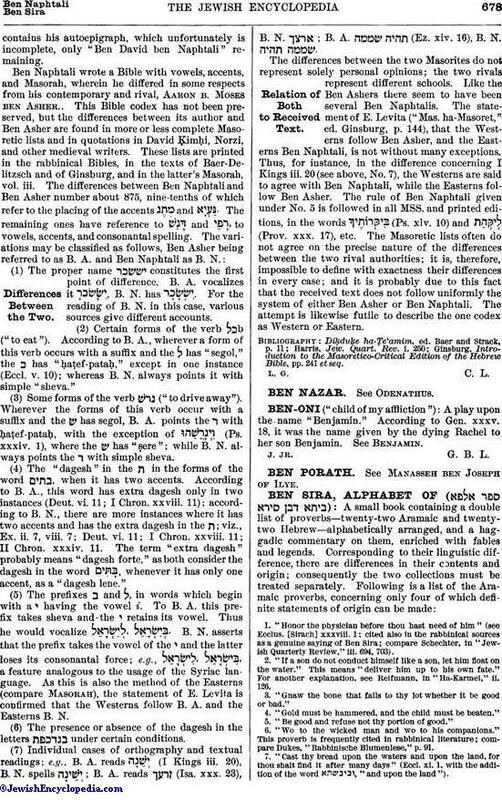 17 is to be read , in which the four פ's make a paronomasia. Similarly No. 22 of the Alphabet shows that the manuscript reading of No. 71 of Aḥiḳar is correct in omitting , "not." The meaning of No. 22 is that one grown suddenly rich is accustomed to the niggardly ways of his poverty, and is not free in giving; but a rich man grown poor will remain true to habits of generosity. It is impossible to determine the date at which the commentary was written, but it was probably about 1000, the end of the gaonic period. Concerning the locality of its composition there is no doubt. In the first place, the stress laid upon never omitting the formula , "if God wills" (on No. 11; ed. Venice, pp. 9b, 10a), shows that it originated in a Mohammedan country; for the use of formulas was introduced to the Jews by the Mohammedans. In the second place, the exact words of an Arabic proverb are cited (on No. 22; ed. Venice, p. 16a) with the phrase "There is a proverb among the 'goyim'" (Gentiles); and a writer living among Christians would not refer to the Mohammedans as "goyim." Moreover, the commentary alludes to the arbitrariness of the Mohammedan ruler (No. 8; ed. Venice, p. 6), and in another passage denounces the divorces frequently occurring among the Arabs and their Jewish countrymen. It is difficult to decide which version of Bidpai Ben Sira drew upon, since the date of the composition of the Alphabet has not been determined. The earliest authority who cites the little book is the author of the 'Aruk, s.v. , ed. Kohut, vi. 450; but it is doubtful in what form he knew it; and there is reason to suppose that it underwent changes—insertions and elaborations—in the course of time. 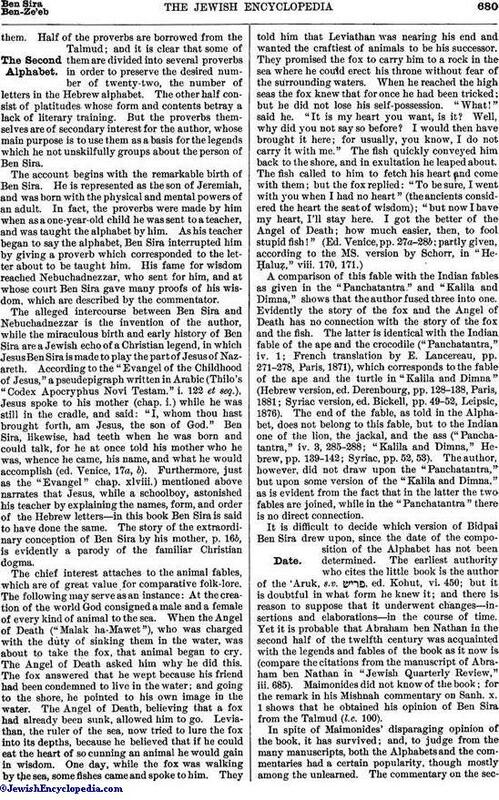 Yet it is probable that Abraham ben Nathan in the second half of the twelfth century was acquainted with the legends and fables of the book as it now is (compare the citations from the manuscript of Abraham ben Nathan in "Jewish Quarterly Review," iii. 685). 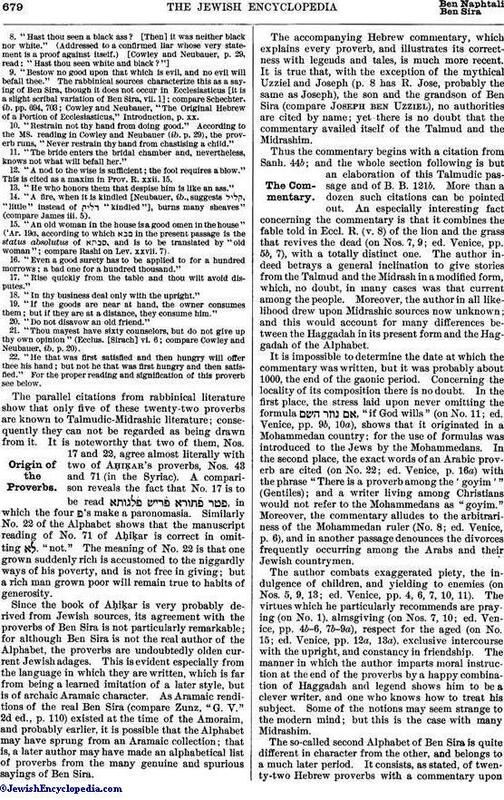 Maimonides did not know of the book; for the remark in his Mishnah commentary on Sanh. x. 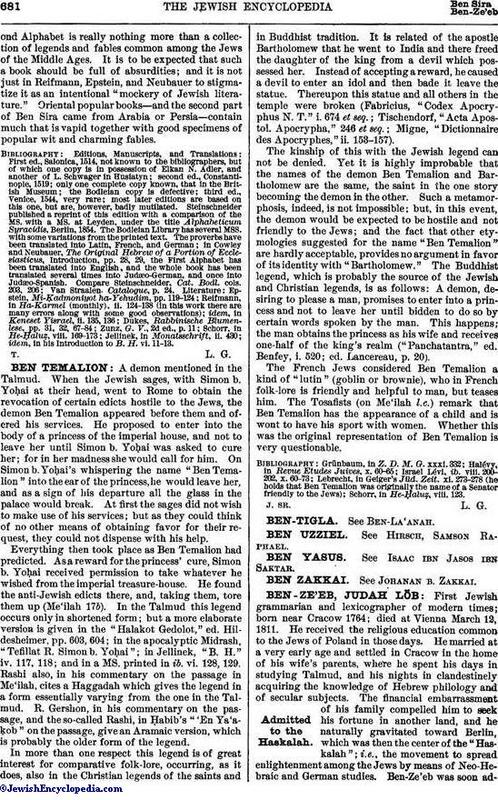 1 shows that he obtained his opinion of Ben Sira from the Talmud (l.c. 100).